The USM Eco-Rep Program will not be accepting new applications for the Fall of 2019. You are encouraged to submit an application for the Spring of 2020. 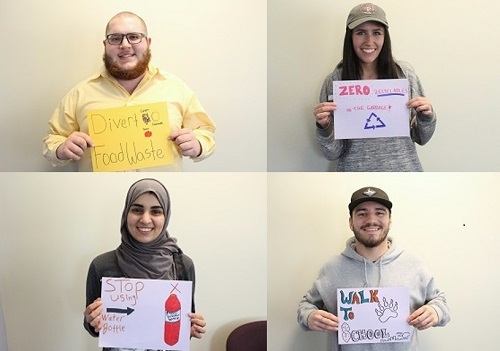 The Eco-rep initiative cultivates environmental responsibility by training student leaders to engage and lead their peers in sustainable practices at USM. Eco-reps encourage environmentally responsible behaviors among their peers with educational and awareness building activities. Eco-reps report to one of three staff members in the Office of Sustainability. Projects encompass all manner of environmental subjects, including recycling & waste reduction, biking & alternative transportation, alternative energy & energy conservation, greenhouse gas emissions & climate change, pollution & stormwater, and sustainable landscaping. Who Should Become an Eco-rep? Interested? Fill out this quick form and someone from the Office of Sustainability will be in touch shortly. Be a part of something great; become a USM EcoRep!